My First-Aid Stick is an antibacterial, antiseptic, and regenerative salve for cuts, scrapes, abrasions, bug bites, rashes, diaper rash, dry, cracked skin, and eczema. One customer even rubs the stick along her forehead to whisk away headaches! Click here to read her full testimonial! Ingredients: Beeswax, Extra Virgin Olive Oil, Sunflower Oil, TAMANU OIL, CALENDULA OIL, SHEA BUTTER, SEA BUCKTHORN OIL, ROSEHIP SEED OIL, and essential oils. 100% natural ingredients. If you would like to order a First-Aid Stick ($12), click here! 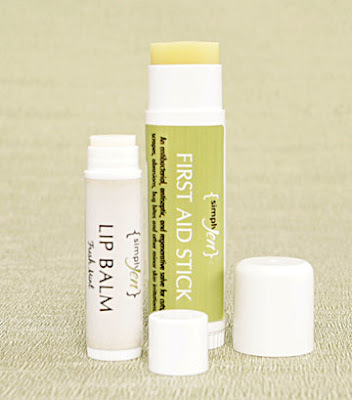 PS - This photo shows the size of the first-aid stick (.65 oz) compared to a standard .15 oz SJ lip balm. This stick lasts a long time. SJ Survey plus 20% off!